Mumbai, August: 5 students won the 6th edition of Godrej LOUD at the Godrej headquarters in Vikhroli. 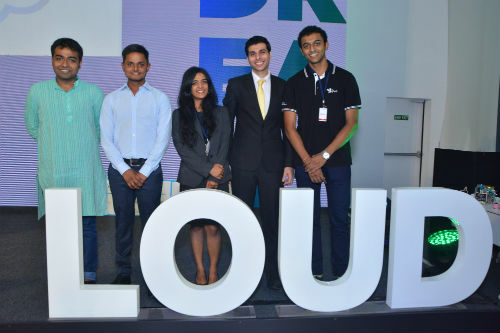 11 students from India’s top business schools presented their personal dreams as part of the Godrej LOUD (Live Out Ur Dream) 2017 finale. Godrej LOUD is a campus hiring programme to find young and passionate first year business school students with diverse interests outside of work. The finalists presented their dreams to a jury of senior Godrej leaders, including Vivek Gambhir, Managing Director and CEO, Godrej Consumer Products, Balram Singh Yadav, Managing Director, Godrej Agrovet, Nitin Nabar, Executive Director and President, Godrej Industries (Chemicals), Sumit Mitra, Head – Group Human Resources and Corporate Services, Godrej Industries Limited and Associate Companies and Robert Menzies, Head -Corporate Strategy and Planning, Godrej Industries Limited and Associate Companies. This year, Godrej LOUD attracted over 1,400 applications from across India’s top business schools. Team Godrej LOUD visited 12 campuses over 2 months (SPJIMR, Mumbai; NITIE, Mumbai; IRMA, Anand; IIM, Ahmedabad; SIBM, Pune; SCMHRD, Pune; IIM, Kozikhode; IIM Trichy; FMS, Delhi; MDI, Gurgaon; IIFT, Delhi and XIM, Bhubaneswar) to engage with first year students.